Climate variability impacts the components of hydrological cycle especially evapotranspiration (ET) and soil moisture, that plays a crucial role in determining water flux of an agriculture system and is thus, essential to study the response of ET to climate change. The present study is an attempt to understand the trend in observed ET (1978–2003) and variation in projected ET RegCM4.0, RCP 4.5 scenario during 2040–2060. Observed ET is compared with simulated ET using NCEP, NASA Power, RegCM4.0 and agriculture field data. 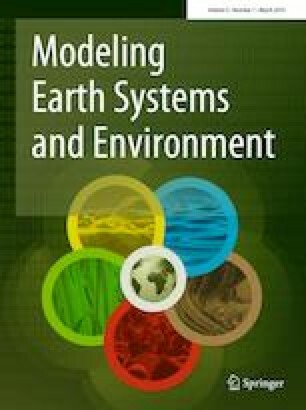 Apart from studying the effect of relative humidity (RH), solar radiation (SLR), minimum and maximum temperature and wind speed (WS) on ET, the FAO Penman–Monteith and Priestly–Taylor methods in CERES Rice and CERES Wheat crop model were used to simulate ET. Further, the cumulative impact of rainfall and ET on agriculture drought has been estimated based on standardized Reconnaissance Drought Index (RDIst). The result shows a declining trend of ET during 1978–2003, but an increase during 2040s (2040–2061) for both wheat and rice. Overall, the ET simulated using weather data input from agriculture field shows highest concordance with observed ET, followed by NASA/RegCM4 and NCEP. Moreover, the FAO Penman–Monteith gives more accurate result in comparison to the Priestley–Taylor method. Environmental modification suggests that RH is the most influential parameter for ET followed by temperature, SLR and WS. Based on RDIst it was observed that rainfall is negatively associated with ET and their cumulative effect on water availability can be efficiently estimated using drought index. Authors thank the Climate Change Programme, Department of Science and Technology-New Delhi (Grant no: DST/CCP/CoE/80/2017(G)), for financial support. The authors wish to express their gratitude to India Meteorological Department, New Delhi for providing observed Evapotranspiration data. We are thankful to Department of Agronomy, Institute of Agricultural Sciences, B.H.U. for providing observed temperature, solar radiation, rainfall and wind speed data. We are grateful to CCCR- IITM for RegCM outputs from the domain CORDEX- South Asia. All contributors are thankfully acknowledged.